I stumbled upon this recipe and knew it would be good before I’d even tasted it. I’m not sure how I knew that arugula, a fennel bulb and lemon vinaigrette topped with spicy shrimp would be perfect together, (since I’d never even tasted a fennel bulb before) but it was a good hunch. Now it’s my newest pet ingredient – love, love, love it! Initially, I used big expensive prawns and they were fabulous. We loved the dish and the recipe got filed in my special book full of “food finds”. Last night I prepared it again for a friend, but this time I used regular shrimp (from the freezer) and it was still incredibly delicious. We ate on the patio and enjoyed a nice glass of wine while we savored a Montana summer evening. This is just a great recipe. I’ve made it with and without the Ouzo in the marinade and while it definitely adds something, it is also fine without it, so don’t stress if you don’t have it. The original recipe calls for Santa Barbara spot prawns with the head on – like I’m ever going to even see one of those. Heat 3 Tbsp EVO oil over medium. Add red pepper and garlic and sizzle until you just smell the garlic. Pour into a bowl, add the Ouzo (if using) and a generous pinch of the chopped fennel fronds. Season well with kosher salt and black pepper then add shrimp and stir gently to coat. Let the shrimp marinate at room temperature for about half an hour, tossing occasionally. Heat the grill to fairly high heat. Grill the shrimp or prawns for a few minutes on each side until they’re pink. Transfer to a plate. Mix the sliced fennel and arugula in a large bowl. Drizzle 3 Tbsp lemon juice and 3 Tbsp EVO oil over all. Season with salt and pepper and toss to coat evenly. 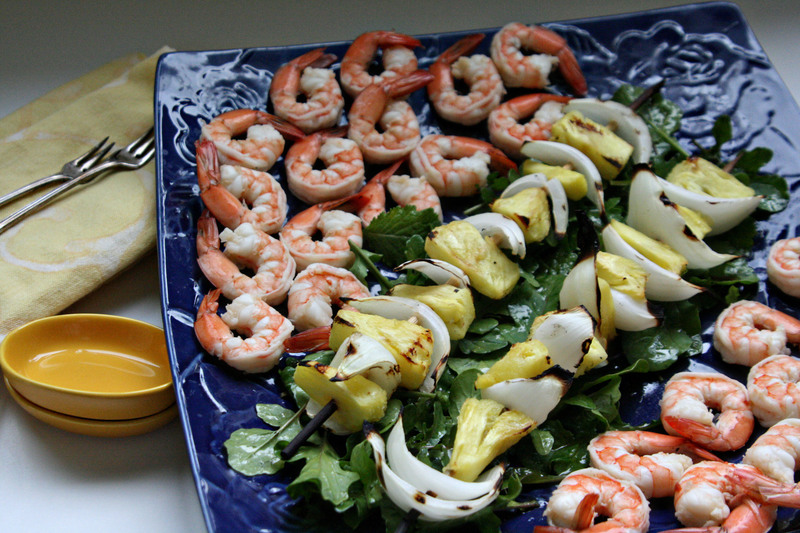 Arrange the greens on a large platter and top with the shrimp. Garnish with the remaining chopped fennel fronds. I added a few sliced orange tomatoes from our garden – yum! Serve with a chewy bread and a glass of wine . . . now how easy is that? Hallelujah, it’s finally hot in Montana! The gardens were very late this year with such a cool June, but the long summer days up here make up for it, and they’re going great guns now. I was going to use a roll of pre-made pie dough because I am baking impaired. To start, you make pie crust “cookies” which were a cinch with purchased pie dough. Simply unroll and cut out shapes then bake according to the package directions for a pre-cooked shell. I used my old biscuit cutter and parchment paper and it worked like a dream. I pricked the cookies with a fork and gave them a sprinkle of sugar then slid the parchment onto the cookie sheet. The beauty of just making the crust as opposed to a pie, is 10 minutes in the oven instead of close to an hour. Ugh! With no air conditioning up here we try to avoid the oven until September. While the cookies baked, I started the sauce. Are you ready for the ingredients . 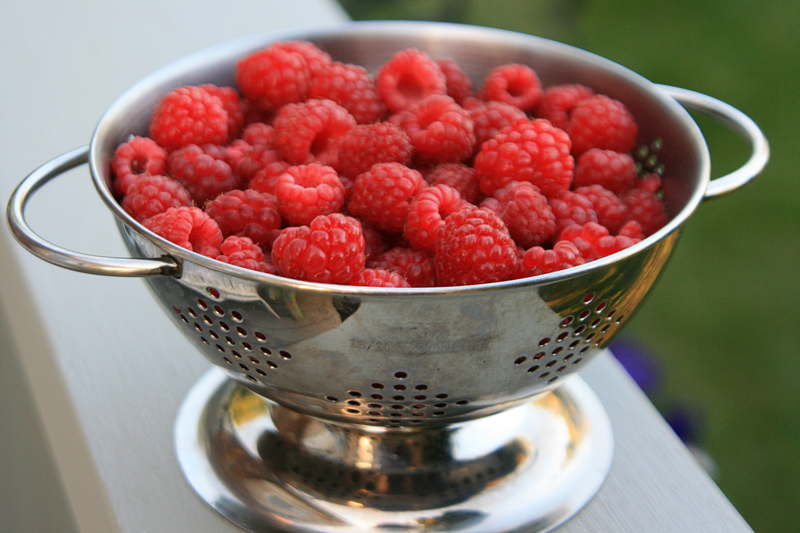 . . 1–½ cups raspberries and ¾ cup sugar! Now how easy is that? Bring the sauce to a boil over medium heat and then simmer about 10 minutes until it starts to thicken a bit – it will thicken more as it cools. Refrigerate until use. 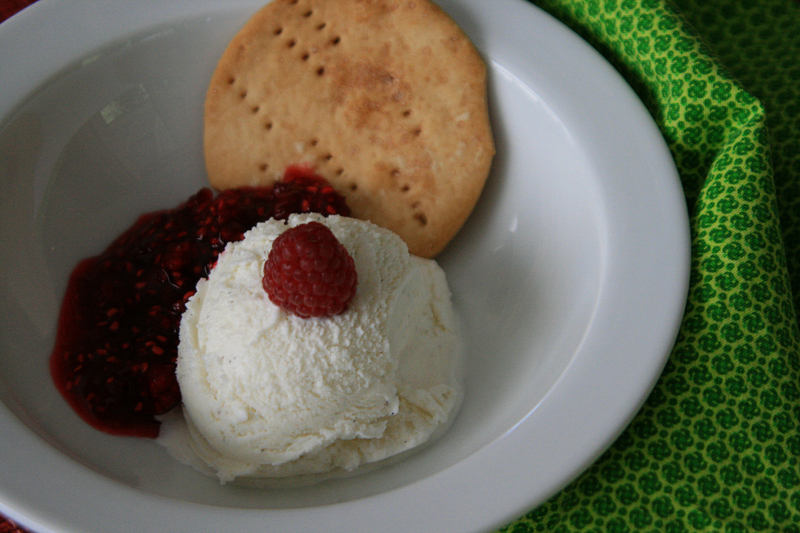 To serve, I used a scoop of vanilla bean ice cream, a dollop of raspberry sauce and a cookie. I topped the scoop with a fresh berry. A mint leaf would also be pretty if one happens to have them on hand – I did not. I learned a couple of things with this last photo. Two scoops of ice cream with raspberries on top look just like boobies. Also, ice cream is difficult to photograph on a warm day. Fortunately, Dana didn’t mind eating the ice cream boobies or the second melty dish so it was a win/win for both. This is a super easy and delicious way to have pie and ice cream and got an enthusiastic “thumbs up” from my taste testers. The crust counters the sweetness of the sauce nicely. I’ll be doing this one again with other fruits and ice cream flavors. Peaches sound delicious, don’t they? As always, the sun comes out up here and sitting at the computer turns into something you used to do when you couldn’t play outside. Here are a few pictures to prove that I’m not just slacking . . . 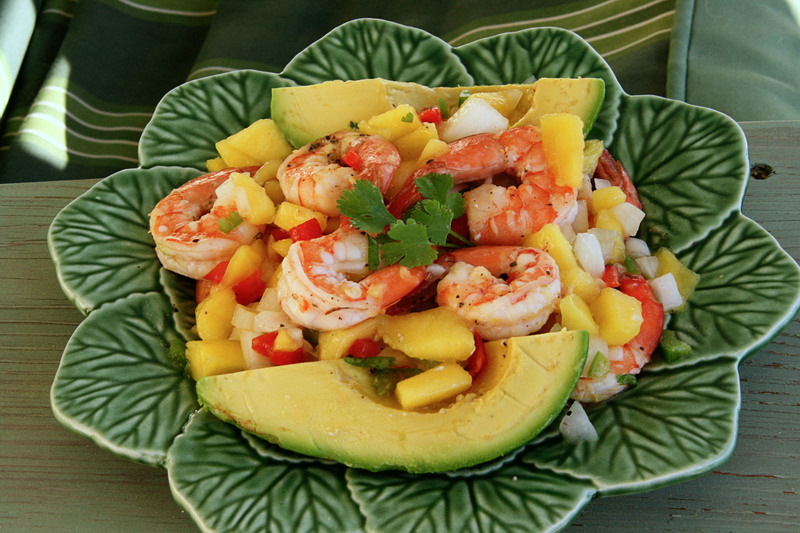 This delicious salad is simply sautéed shrimp over avocado quarters which is then covered with a fresh mango relish. The relish has diced mango, red pepper, jalapeno, sweet Vidalia onion and cilantro gently stirred with a drizzle of olive oil and lime. It incorporates the three F’s of summer food – fresh, fast and fabulous! 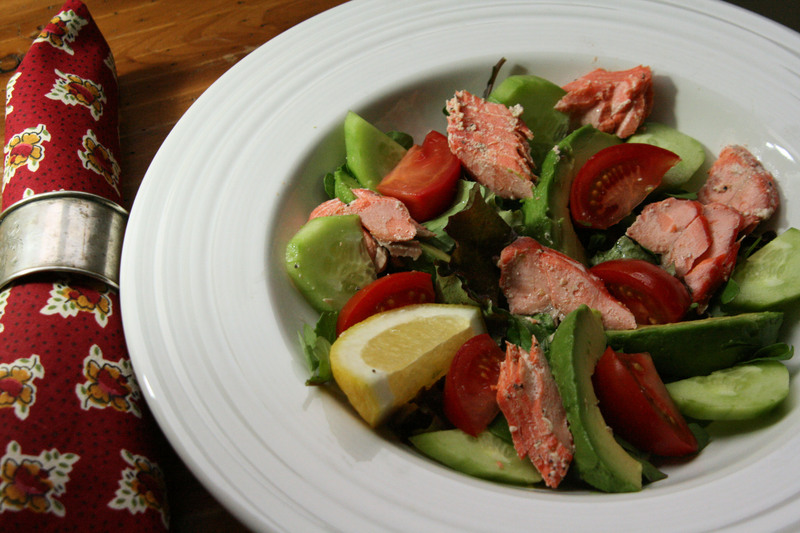 Another easy salad we’ve enjoyed is made with cold salmon chunks on a bed of freshly picked arugula, avocado and cucumbers and then drizzled with a fruity vinaigrette. Summer is breathtaking up here, wondrous things start popping out of the ground and incredible wildlife appears in our backyard. It’s nothing to see a Bald Eagle or an Osprey with a talon-clenched fish fly over your house or your car on the way to work. Two of my neighbors have had black bears in their yard! I believe pictures say it better than I can, so I’m adding a little slide show. This Moment – A single photo, no words – capturing a simple, special, extraordinary moment. A moment you want to pause, savor and remember . . .
We interrupt this busy gardening season . . . .
To bring you dinner! Nothing terribly fancy here, some shrimp boiled this afternoon, then chilled for dinner. (The boiling concoction included water with beer, spices and lemon.) When it got “about that time” I picked a shirt tail full of fresh peppery arugula and mustard greens, which I tossed with a simple orange vinaigrette; I then placed the dressed greens in the middle of a platter and arranged the chilled shrimp around them. Dana grilled two easy skewers of fresh pineapple pieces with wedges of sweet Vidalia onion while I made a quick cocktail sauce with ketchup, horseradish and lemon. Easy-peasy and crazy good. This has been a busy season! The snow pack in the mountains is about 200% of normal and not melting due to persistent, cool weather. It’s been compounded with lots of rain in the valley and more snow in the mountains. All that snow is keeping the weather on the chilly side and gardening is LATE this year. I took this on the way home. 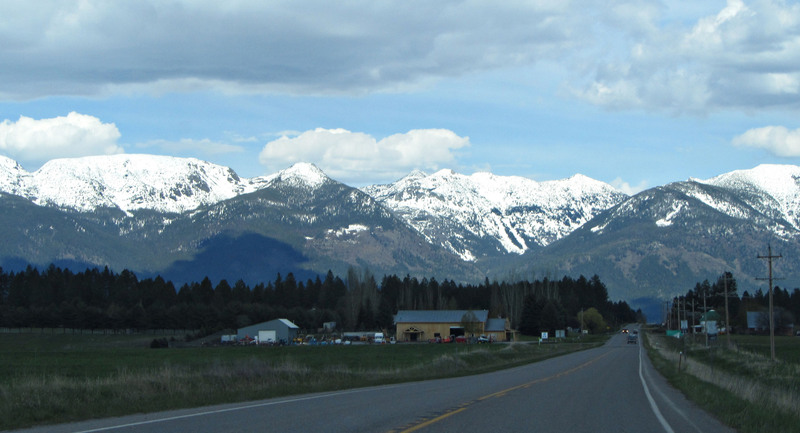 These are the mountains to the east of us and then to the north of us. Crazy, huh? Still, it’s beautiful and a little cold rainy weather is NOTHING compared to the weather that some are dealing with. Meanwhile, back at “the farm”, I got a very special birthday gift this year. Dana quadrupled my garden space and made me three new raised garden boxes! I’ve been busy planning and planting and today I went to Hooper’s Garden Center to get some peppers and a few other things that won’t make it from seeds this year. 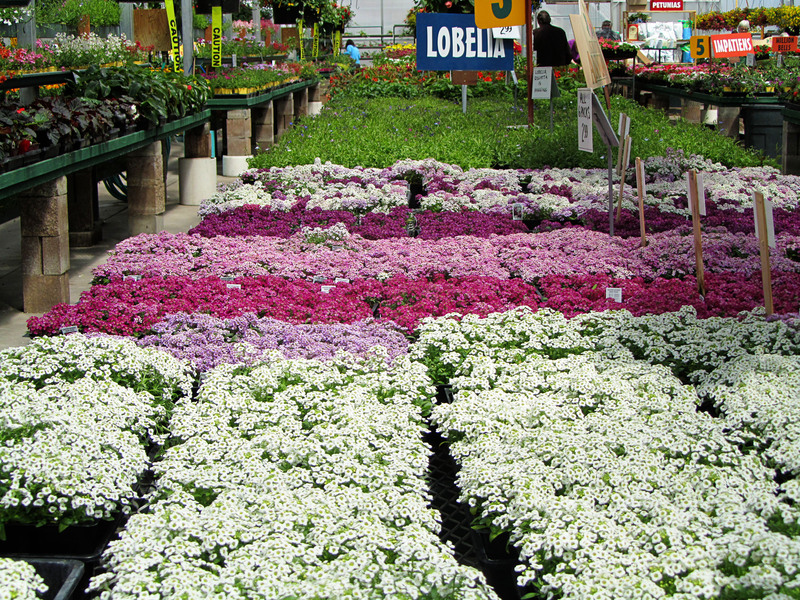 This nursery is a landmark around here – owned by the Hoopers since 1973 and loved by all, it’s a fun place to go. 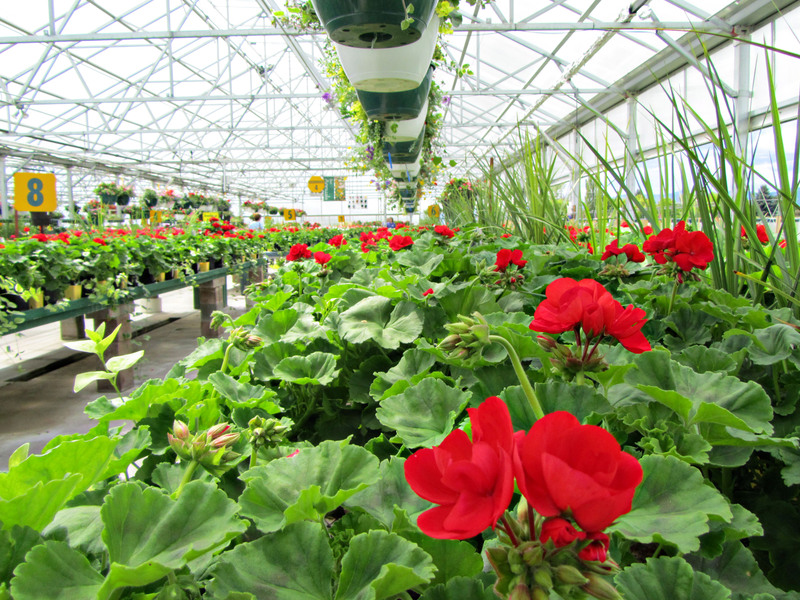 I looked at their website and found out that since purchasing the simple business, they now have 16 greenhouses, a large retail house, garden shop, production area, seminar room, seasonal bistro, and a houseplants area. While you shop you can enjoy free coffee and cookies – aka lunch. I quickly finished my list and then some, but wanted to share a few shots of Hooper’s. 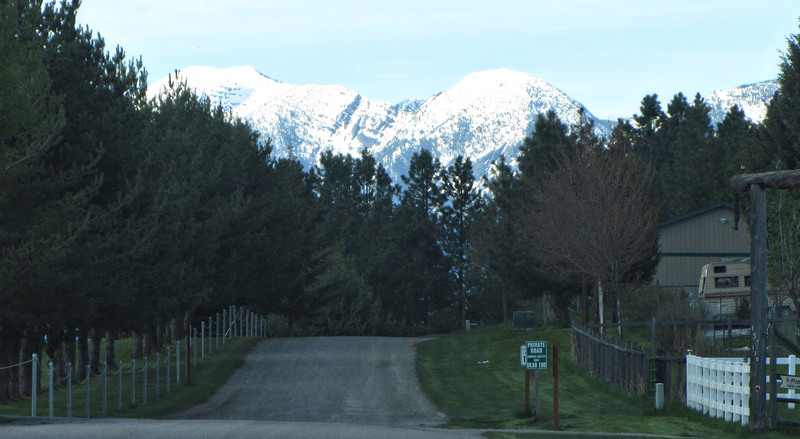 The outdoor area enjoys a gorgeous backdrop of the Swan Mountain Range and the greenhouses are amazing and endless. I came home with a couple of new things to try – purple Brussels Sprouts and CELERY for crying out loud! Will let you know how that turns out. 😉 I’ll be photographing the new garden when it gets a little further along. This risotto quest started a few weeks ago when Christo, from the blog Chez What , posted a series of beautiful risotto dishes. Christo’s blog is fabulous and full of his beautiful food creations and while he’s good to describe his dishes, he’s a little elusive with his recipes. This post was no exception, though he did share his risotto secret when he said that Carnaroli is THE rice to use for risotto. (be still my heart!) Perfect risotto has always been a gamble for me, so the quest for Carnaroli rice was on. I finally found both Carnaroli and Vialone Nano rice and tried them both since several authentic Italian risotto recipes I read recommend one or the other. Having the right rice was only half the battle. I had to try a few recipes to play with my new rice. After sampling several recipes, we found that the ones that start with 2 tablespoons of butter are the ones that turn out reliably delicious. The recipes in one of my favorite Italian cookbooks: La Cucina: The Regional Cooking of Italy all have their fair share of butter in them, so I know I’m on to something. The recipe I’m sharing is, in my humble opinion, the perfect risotto. BTW, he was right about the rice – thank you Christo. This scampi-ish dish with asparagus and saffron risotto only took about 3o minutes to cook, but it was a busy 3o minutes. I was barely able to sip my wine while I cooked and was thankful I had the ingredients thoroughly prepped! It was so worth it. One of those meals where you really enjoy the dinner music because you’re too engrossed in eating to talk about the weather. Dinner conversation consisted of little one word sentences describing the flavors . . . little else. I love meals that turn out that good. The next morning, you can warm the leftover risotto and top with chopped bacon and chives. (OMG, delicious) If you’re feeling feisty, add a poached egg. So satisfying. Prep all the ingredients. The shrimp, herbs and lemon can be put in one dish. This part goes fast so I did it as the risotto was finishing. I preheated my lovely new pan on lowish medium before adding a small amount of olive oil. Cook the asparagus for a few minutes on both sides, then scoot to the sides of the pan and add the shrimp, herbs and lemon juice to the middle of the pan. Drizzle a little more EVO oil if necessary and flip the shrimp to get them pink on both sides. Plate both on warm risotto. Heat 2 Tbsp butter in a sauce pan over medium heat. Add rice and stir for a minute. Add the broth 1 cup at a time and stir until absorbed. If you are adding saffron, add it with the first cup of broth. You can give the stirring a rest from time to time, but you have to stay on task for the most part to get a good creamy texture. After all the broth is absorbed, taste the risotto. You want it to have a chewy texture, but creamy and pretty loose. (it will tighten up a bit after cooking) You can add a little more broth and continue cooking if desired. I found that 3 cups was perfect almost every time. Once the rice is tender and creamy, pull it off the heat and add 2 tablespoon butter and 1/3 to 1/2 cup grated Parmesan cheese. Stir the risotto vigorously until the butter and cheese are blended in. Season with salt and pepper to taste, if desired. Serve at once on warmed plates or hold for the briefest time possible before plating with other ingredients. Fellow blogger and good friend, Lea Ann fromMangos Chili & Z, has a new feature called “No Recipe Needed” where she features some no-fuss goodies. When I told her about this lemon pepper sauce, she encouraged me to steal her idea and share this yummy dip for artichokes. I had to do it. For this dip, I use Boyajian Pure Lemon Oil, but you can use finely grated lemon zest as well. Not only is it SIMPLE, it’s delicious. While the artichokes steam, combine the mayo, lemon and peppper and mix well. Set aside to allow the flavors to blend. I enjoy upcycling old “junk” into something usable and fun. This week, I finished an organization project in my kitchen; it turned this mismatched pile of baskets gathered from various corners of my house into a clutter busting shelf for all the nonsense that gets tossed on the bar. This is after they’ve been unified . . . the paint was a little light, so I went over it with Minwax staining sealer. It gave them a fun anique-ish color, but required an extended airing for the paint fumes. To finish my project, I arranged the baskets on a narrow bookshelf I bought for less than $20 when a local bookstore went out of business. It takes just a sliver of space, but holds all the baskets nicely when placed near the phone and chalkboard. That chalkboard was a project several years ago – made from a framed painting that was just sitting around in the garage. I reworked it with a thin piece of wood and blackboard paint. The artwork in the bottom right corner is a beloved piece done by my grandson when he was 3. It will live in the corner forever and ever. Amen. This is a little hard to read, but I zoomed in to show you what a workhorse this new little unit will be . . .
Disclaimer: the folks at Boyajian don’t know me from Adam . . . but I’d love to be a taste tester for them! Do you have a flavor that beckons to you when you’re browsing through a cookbook or a menu? I do. If I see lemon zest or lime zest, my mouth waters and I explore further. 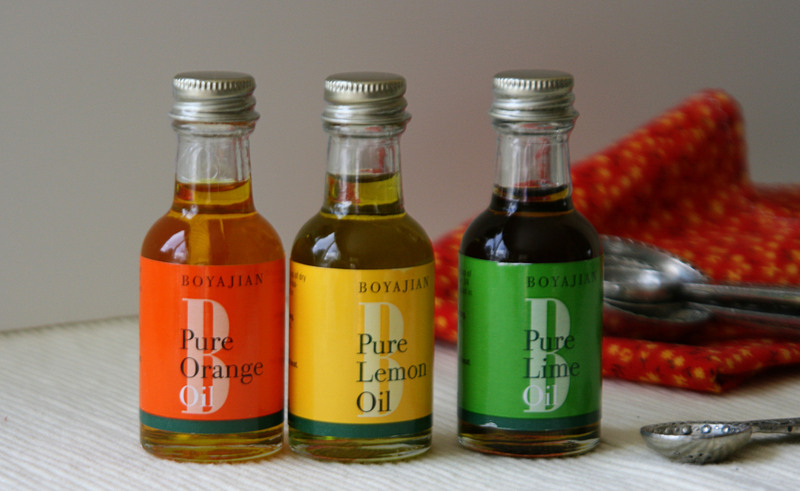 I was reading a cooking article in a magazine several years ago that recommended using pure citrus oil if you’re going to add citrus flavoring – and Boyajian Pure Citrus Oils were recommended as the best. I ordered a sampler pack and have kept them in the door of my fridge ever since. When I got my first order, I read on the back of little green box, ” To appreciate the remarkable intensity of these oils, imagine it takes 44 oranges, 66 lemons and 80 limes to fill a 1 oz bottle of oil. Use sparingly in place of peel or zest.” (I really think there should be exclamation points after those statements) It’s hard to shut me up when I start singing the praises of these magical oils. They’ve been one of my secret ingredients for a long time and I’m finally spilling the beans. The orange oil is useful for baking, but since I don’t bake much, it sat in the fridge for a long time until I figured out another use. 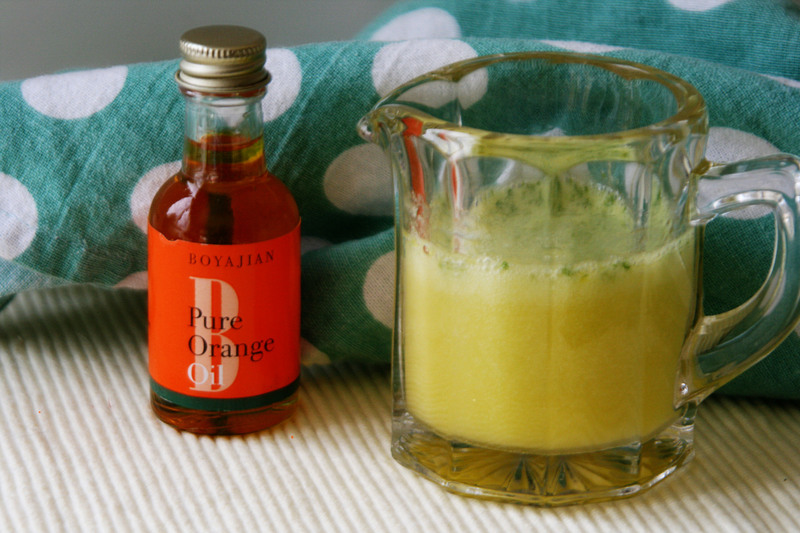 Orange Honey Vinaigrette. 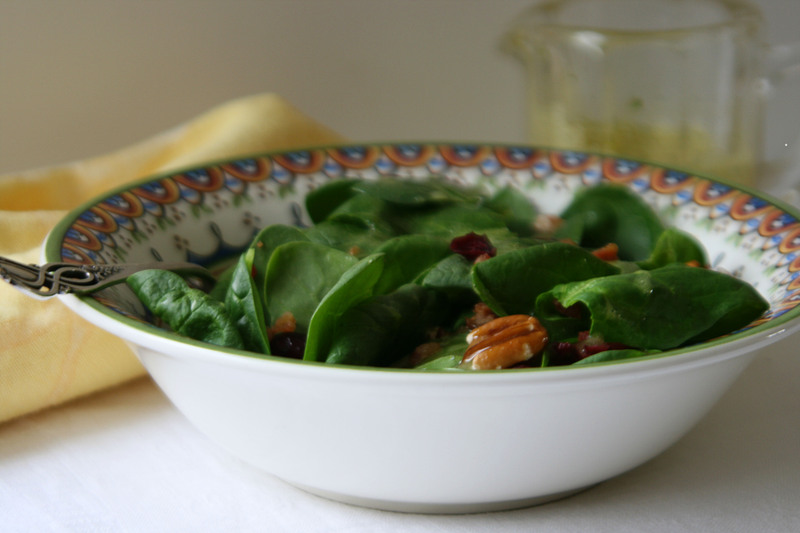 A scant 1/4 teaspoon turns a vinaigrette into an exquisite dressing for a spinach salad. This one is 2 parts EVO oil, 1 part (white) vinegar, honey to taste and a 1/4 tsp orange oil. I added a bit of parsley because I found a winter survivor in my herb garden. This salad is a simple mix of baby spinach, Texas pecans, dried cranberries and chopped bits of bacon. The Pure Lemon Oil is a favorite. I add a few drops to mayonnaise with a few grates of fresh pepper and use it as a dipping sauce for artichokes. It can also be used for a quick aioli sauce and sometimes I add it to EVO oil to saute veggies. 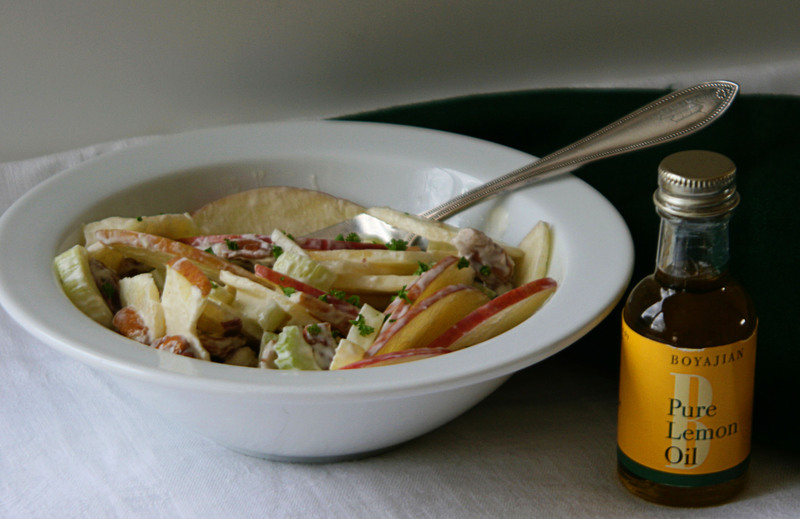 Hands down, one of my favorite uses is in a Waldorf salad. It brightens the flavors so much, it puts a big grin on my face when I taste it. Then there’s that delicious Pure Lime Oil. It’s also incredible mixed with mayo or EVO oil, but it has a ton of other uses. A dab stirred into margaritas or Mojitos gives them a zesty citrus punch. 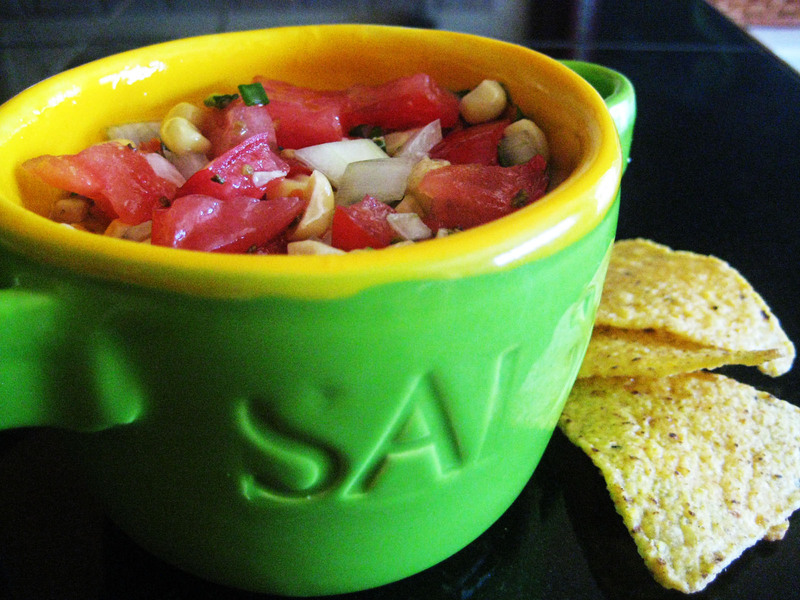 One of my favorite ways to use it is in homemade hot sauce and it rocks in fresh salsa. I make one with fresh corn, tomatoes, onions, cilantro and peppers in the summer and it never lasts long. Goooooood stuff. One last thing . . . both times I ordered from Boyajian, they added a complimentary product sample. Check out their site and some of their other oils and vinegars. Delicious! Besides being my Pilates guru, my friend Michelle is an amazing cook. We love to talk about food, share recipes and exchange ideas. After class, we sometimes head over to the house to swill sip wine or Limoncello while we conjure up something delicious. This was the case last week, when she told me about her latest creation, “Yum-Yum Yams.” They sounded divine, so we made a plan to get together for an after-class nosh. 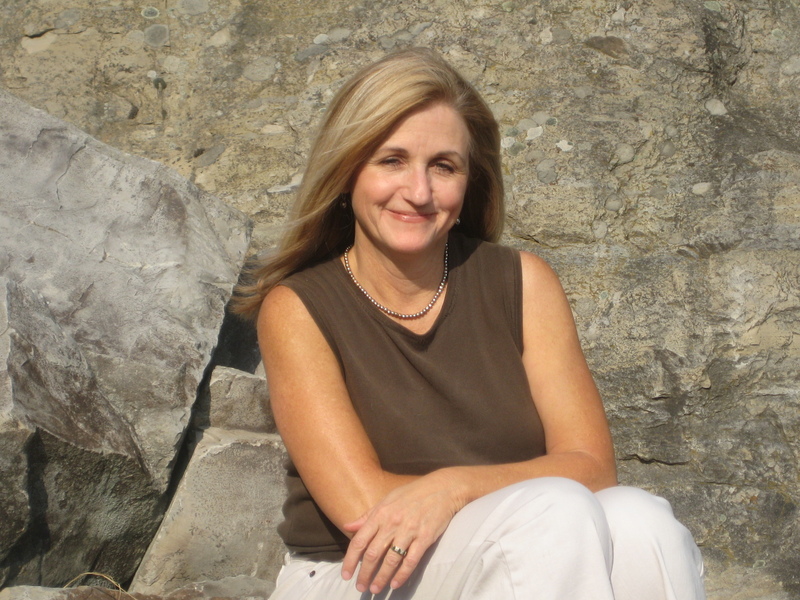 She’s always told me that sweet potatoes are an A+, guilt-free vegetable and I looked them up to get a little more info for this post. According to the nutritional data I found, they’re one of the top 10 foods we should be eating. And seriously people . . . these things are the BOMB! 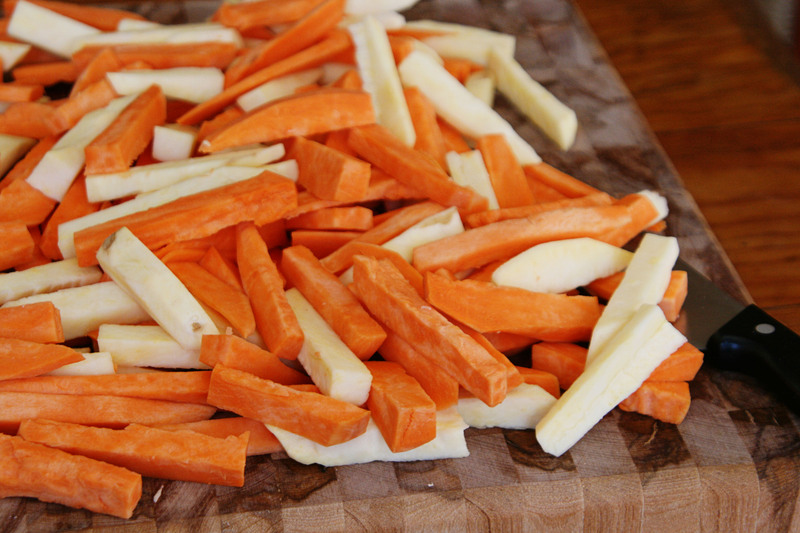 First, cut 3 or 4 sweet potatoes into rustic 1/2″ fries. I peeled mine, but I’m not sure that’s necessary. Michelle used 2 regular sweet potatoes and two of the more orange yams (which are also sweet potatoes). 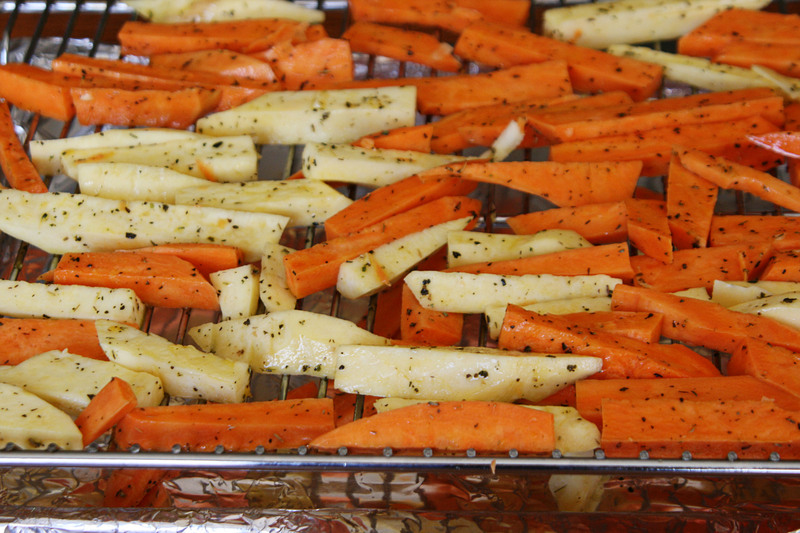 Toss them with olive oil and 1 or 2 tsp Herbes de Provence. Place them on a wire baking rack. I recommend lining the baking pan with foil. Bake them in a 450° oven for 15-20 minutes on the upper shelf and then test them with a fork for tenderness. When they’re tender, you can remove them or continue to bake them to your preferred brown-ness – I cooked them an additional 10 minutes. Watch them carefully – they cook fast. Salt and pepper to taste and then nosh away – it’s really hard to believe these are guiltless! 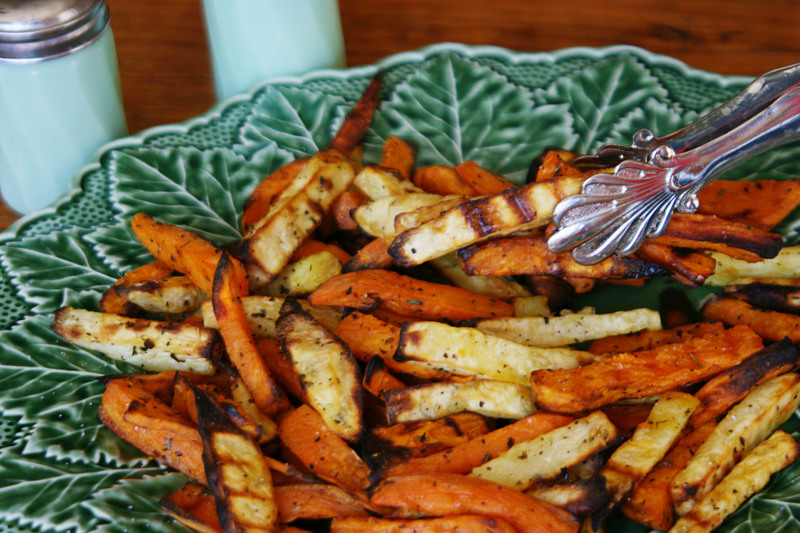 The Herbes de Provence goes beautifully with the slight sweet taste of the fries. Thanks, Michelle, for another wonderful find!